This is Part 3 in a 5 part series about why a chatbot was the hardest thing I’ve ever designed. This article will explain how, when and why you should personify your chatbot to make it more appealing to your users. It was originally published on Medium. If you’re in the tech industry, you’re probably familiar with what I mean when I say chatbot. But to the majority of the world, they’re still a novelty. I laughed, but this is a reality. There are a lot of people have encountered a bot in their life but most of those encounters are with bots that were not nearly as capable as some bots are today. More than likely the experience they had was very robotic, automated, and cold. It’s important that you keep this in mind as you build and market your bot. Creating something that people are comfortable with is just as important as creating something that gives people exactly what they want. What does your bot look like? Ultimately, your bot is a conversation. If your bot is in an interface, its going to look like a conversation with a friend. But how do you visually define the thing your user is chatting with? And would it do better off as a physical product instead of a digital interface? For the majority of us, our bots are going to be visualized by a small 35px by 35px circular image. That’s a small amount of space, but a big opportunity for your brand. 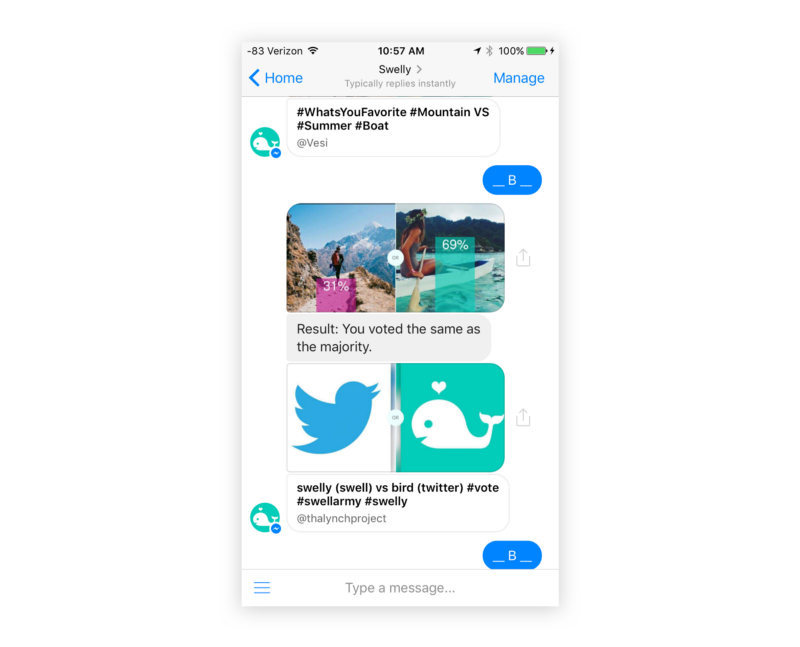 How you visualize your bot will shape the conversation your users have with it. Just think for a second. When you message someone and you see their face pop up, isn’t it much more comforting than when you get a message from some brand logo? We naturally look for familiarity in the world around us. We hope to find something relatable. It’s why putting faces in your marketing site, your product, or your blog post make it so much more clickable and friendly. You can read all about it in Designing for Emotion by Aarron Walter. At the same time though, we want to make sure we don’t overdo it and create some finely detailed piece of art to represent our bot. It’s a small space, and fine details will go unnoticed. Simple, flat design often works best: If you’re in close on FindMelody you can see the details of the skeuomorphic disco ball, but at such a small scale it doesn’t work as well. Text probably won’t be legible: We know 1–800-Flowers.com so we don’t really need to read it, but can you read “Chat to book” on Chatobook Restaurant Chatbot? Detail won’t be noticed: Can you see the whiskers on PennyCat or the hoody strings on Poncho? How about the tape on GeniusBot’s glasses? Diced Pineapple kinda works because it’s black and white, and we mentally know what a pineapple is supposed to look like, but if we didn’t, the details would be lost at such a small scale. If your bot takes the form of a physical product there is a whole different set of rules you need to consider. While most people may not think of these as chatbots, that’s essentially what they are. 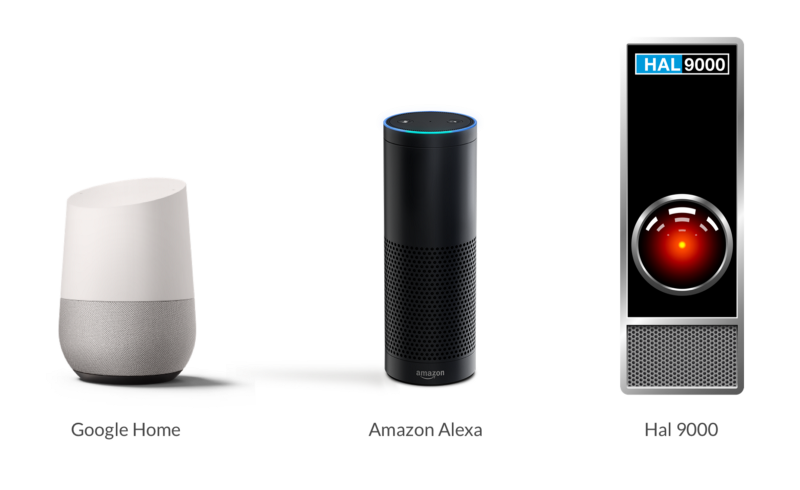 Physical devices that use Artificial Intelligence to re-create the experience of having a conversation with a human being. With physical products you have to think not only about the visual design of the product, but also the sound. And the form these two aspects take should compliment each other. Take Google Home for example. It’s built for the home. The target audience for Google Home is focused on tech savvy younger people who use technology to make their life more efficient. The physical design of Google home was created to be something that would blend in, or improve, the beauty of a modern home. It was built to be the center piece of the room it lives in, so it can’t just be some blocky speaker that you talk to. Compare this to Hal 9000, which was created to represent a futuristic, robotic virtual assistant. It’s boxy. It has a lazer looking eyeball thing going on. It’s nothing you’d want in a modern, elegant home. The voice of Google is also much more natural than many bots that have come before it, both real and in movies. The sound of your bot should match the physical appearance. It would be weird if Google home sounded like R2D2 or C3PO, and it would more than likely make consumers feel weird. Design for the space it will be used: As with any physical product, you need to consider where and how this thing will be used. It’s not locked into specific dimensions like a digital interface. How do you make the product integrate meaningfully into the user’s life? It should sound like users would expect: A lot of people are scared of bots/AI taking over and think of dystopic terminator type situations. Do you want your bot sounding like terminator? Probably not. If you’re making a fitness bot, maybe it’s personality is a bit intense. But if you’re making something that’s in a more intimate space, it should probably be gentle and kind. Give it a name: One of the most common questions I get from people is “Why did Google name it’s product Google Assistant and it’s physical product Home?” I can’t answer this for certain, but Google has stated before that they did this to make a genderless product that aligned with the rest of their products. In doing so, I believe they missed an opportunity to humanize Google. None of us really know the best practice for this yet, but it’s a fact that users will attribute human characteristics to the things they use. It’s human nature. My opinion: use this to your advantage. What’s having a conversation with your bot feel like? Once you’ve got visuals down, it’s important to recognize the role Tone of Voice (TOV) plays in your bot experience. The TOV and the form your conversations take will ultimately be the core of your experience. Creating the visual appearance of your bot is the easy part. Training your bot to chat with users, and react appropriately, is the hardest part of the whole thing. What happens when your users are having a good time? One of the most incredible things about bots is that we have such exclusive access to user sentiment. You can understand how users feel about your product with apps and websites, but you usually have to ask your users for that kind of data. With a bot users are in a conversation and, if it’s done right, sentiment can be inferred through the context of the conversation. If you’re smart, you’ll build your bot to trigger specific sentiments from your users then create hooks to leverage those sentiments and make the experience even better! Every great product uses emotion to create a bond with the person using it. We have more access to those sentiments now than ever before. The same mentality should be applied when designing the experience for negative sentiment. When your users aren’t having a good time, you should have triggers to recognize this. Does your bot break and feel like an empty abyss or does it work to fix its own errors? When your users are unhappy with the experience, will your bot recognize this and work to guide the conversation in a different direction or will it continue on script, like an emotionless robot? Leverage this knowledge of negative sentiment to save face and create triggers to guide your users back to their happy place.
? ? ? ?? ? ? ?? ? ? ?? ?? I throw up in my mouth a little every time someone asks me this. Just because you found some Kik bot that’s targeted at 16 year olds uses emojis like it’s your birthday every day doesn’t mean your bot needs to too! Your bot should reflect your brand. If your brand were a human being, how would it speak? What kind of language would it use? Would it use emojis? I can’t tell you yes or no on emojis because at the end of the day they are fine when used appropriately. But ask yourself those questions before going too far down the wrong path. Leverage your brand: Your brand has taglines, slogans, marketing copy, all of the above. Your bot shouldn’t feel like an advertisement, but your users probably have an intuition about how your brand would sound. Leverage your brand identity. Listen to your users: Most brands have some way for their audience to interact with them, whether that’s social media, online forums or just a contact form on the marketing page. Figure out how your audience communicates with each other and leverage that language — the slang, the underlying passions, the idiosyncrasies— to develop the way your bot converses with the world. My best advice: Study conversations between people that represent your target audience. Defining the language your bot uses, the TOV it inflects, and how it reacts is a whole new world of User Personas. Yes, we still need to study behavior and try to figure out what our users will need from a product standpoint, but now we need to know how these people communicate too! People are naturally going to attribute a personality to your bot whether you want them to or not. It’s an innate human tendency to do so. The term is anthropomorphism — the attribution of human traits, emotions, and intentions to non-human entities. The personality your bot exudes, the intangible thing that is designed to meet your users at the core of their being, is what will end up pushing your bot up the rankings and into the hearts of the public. What Impact Did Envato Make in 2018?